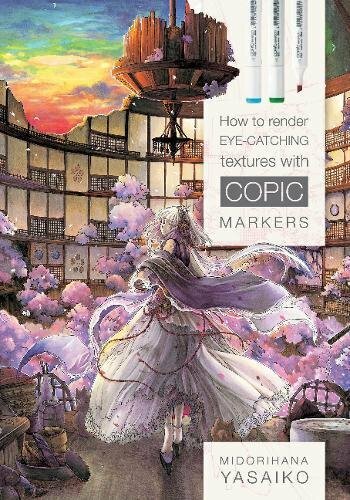 This is a very detailed instructional book on how to use Copic markers for colouring by Midorihana Yasaiko. The book's a 160-page paperback and is split into three section. The first section features several full-page coloured illustrations, followed by an introduction to Copic markers and drawing techniques, and lastly full length tutorials. This book assumes no prior knowledge to using Copic markers. You can follow along very easily because the instructions are clear and concise, and comes with step by step pictures. The only thing you need if you want to follow along exactly is to get the same coloured markers mentioned. This book uses a lot of colours so be prepared to spend some money on buying Copics. There are only four full length tutorials in the book. The tutorials are selected full-page illustrations shown in the gallery at the start. You can copy the illustration drawing and learn to colour from the hands-on tutorials. Each tutorial is incredibly detailed and goes through colouring a complicated scene area by area. The colouring style is very manga-style since the artist and author is a manga artist and illustrator. She goes by the pen name Hidekazu Gomi when drawing boys manga. Overall, the book is packed with loads of useful information. It's a very hands on book so you really get to learn a lot. Learning by drawing, doing, is indeed the best and fastest way to learn art techniques. Great book. Highly recommended.